Hey everyone! 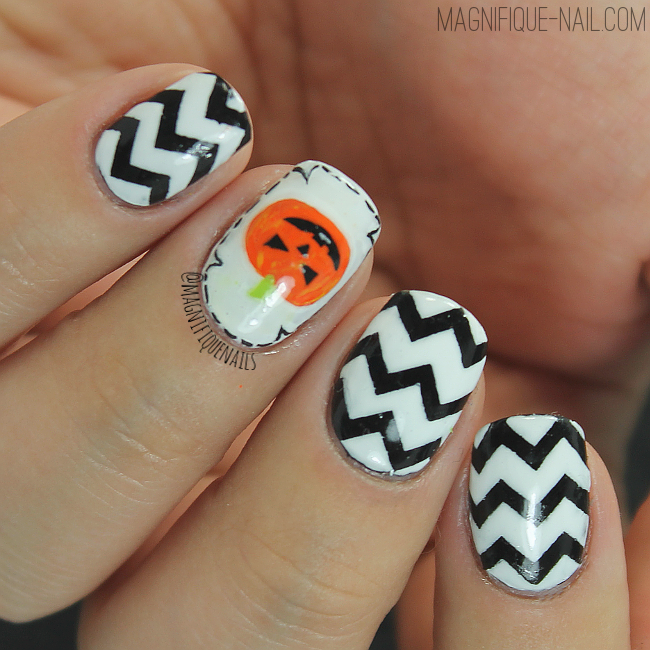 Who doesn't love an awesome Halloween nail art design, I know I do hehe! This is an exciting month to sit back, relax with some hot cocoa and watch some of my favorite scary movies! Whenever I think of Halloween, I think of pumpkins. It's the only thing that pops in my mind. As per usual I was browsing online for some inspiration. 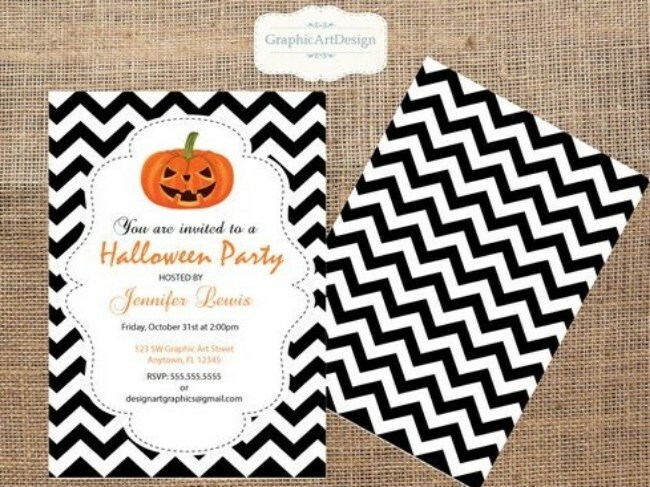 I then came across with this cute card on Etsy (sorry I don't remember the artist), with a pumpkin and chevron design. I loved it so much I knew it had to be on my nails. 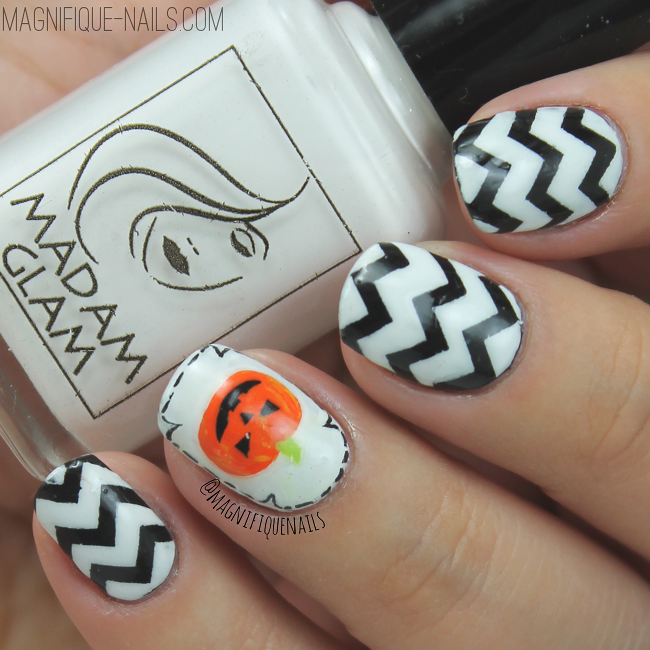 I even wanted to create the dash outline around the nails, just something different from what I've seen. 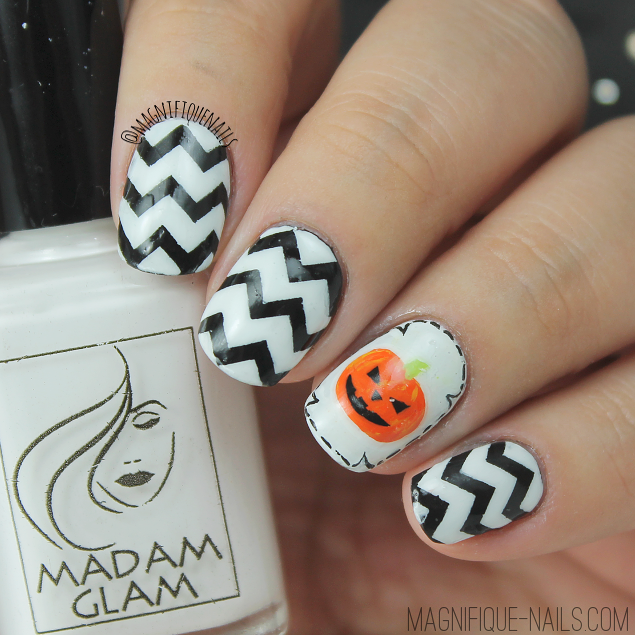 For the design, I began by applying two coat of Madam Glam Black Hole and Snow White on the ring finger. I love the formula on these polishes! If you haven't heard of this brand check here for my full review on their shades. Once the polishes was completely dried (important when adding vinyls to the nails), I then added the chevron nail vinyls from The Little Lacquer Bean. I then applied two thin coats of Madam Glam Snow white over the vinyls. Using a tweezers I carefully removed the vinyls, and fixed some mishaps with a nail art brush. Now for the pumpkin, using a a nail art brush, I first freehand the pumpkin and facials with acrylic paint. Using a stripping brush, I dash outlined around the nails, resembling the card. Lastly, I sealed the design with H K Girl Top Coat, that's it! Overall I really loved how these came out, especially how similar it looks with the card!